Created by BlackBerry (the company, formerly Research in Motion / RIM,) BlackBerry OS is used exclusively on BlackBerry phones. BlackBerry's hope to squash a lawsuit has been dashed by a U.S. judge who says the legal proceedings can move forward. Plaintiffs allege BlackBerry "inflated its stock price and defrauded shareholders" by suggesting sales of BlackBerry 10 handsets were much better than they really were. The case was originally dismissed in March 2015, but new evidence suggests there's merit to the accusations. A retailer called Wireless Zone compiled data that showed a high return rate for BlackBerry 10 handsets. James Dunham, former CEO of Wireless Zone, sold that data to Detwiler Fenton, which generated a report detailing consumers' general dissatisfaction with BlackBerry 10 phones. BlackBerry's executives publicly said at the time that Blackberry 10 owners were in fact "satisfied" and the company insisted that return rates for Blackberry 10 handsets were “at or below our forecasts and right in line with the industry." It is these statements, in light of evidence to the contrary, that the plaintiffs say misled investors and eventually led to shareholder losses when BlackBerry 10 collapsed. BlackBerry did not comment on the matter, which now heads to trial. BlackBerry said this week that it will no longer provide monthly system and security updates to its BlackBerry Priv smartphone. The company originally committed to providing updates for a period of two years. "Having now stepped outside the original two-year window, we will no longer be delivering monthly updates for the Priv moving forward," said the company. That doesn't mean all support for the phone will stop. The company said it will still honor any warranty obligations it has for hardware repairs. Moreover, BlackBerry claims that its handsets are inherently more secure than most other Android devices thanks to the hardened core and monthly updates up until this point. BlackBerry said if a critical vulnerability is exposed in the Priv, it will work to correct the problem as needed. 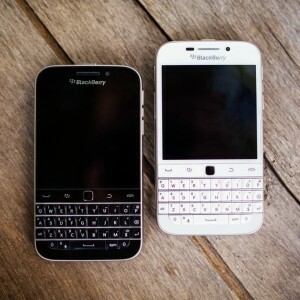 Last, BlackBerry said it has partnered with BlackBerry Mobile to help legacy BlackBerry owners upgrade to newer hardware. Customers still using the Priv or other BB10 or BBOS devices will soon be able to upgrade to a BlackBerry KEYone or BlackBerry Motion smartphone. Specific details regarding the trade-in program are still in the works. BlackBerry today said it will cease manufacturing the BlackBerry Classic handset. The Classic debuted in December 2014 and is one of the last devices from BlackBerry to run BlackBerry OS. 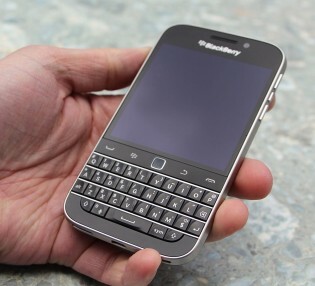 The device featured a traditional BlackBerry design with a touchscreen and physical QWERTY keyboard. "It has been an incredible workhorse device for customers, exceeding all expectations," said BlackBerry. "But, the Classic has long surpassed the average lifespan for a smartphone in today's market. We are ready for this change so we can give our customers something better – entrenched in our legacy in security and pedigree in making the most productive smartphones." BlackBerry says it will continue to support the Classic and expects to roll out BBOS 10.3.3 in August. The device is still available online from select retailers. BlackBerry's most recent smartphone is the Priv, which runs Android. 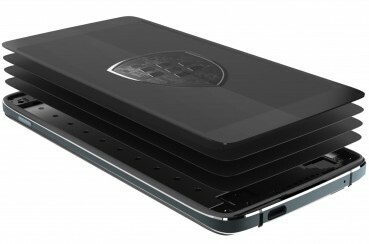 The Priv debuted in late 2015. Facebook has decided to cease supporting the BlackBerry 10 and BlackBerry OS platforms. The company has chosen to discontinue its essential APIs for BlackBerry, effectively breaking the existing app. Earlier this week, the company updated the official BlackBerry Facebook app that replaced the native app with a simple web interface. BlackBerry users face a mandatory update to the Facebook app by March 31, at which point the app will cease to work on BlackBerry 10 and BlackBerry 7.1 handsets. The change will impact BlackBerry 10 users more significantly, as Facebook functions will no longer be available through the BlackBerry Hub. This means messages, comments, notifications, and other content won't be pushed to the phone. Moreover, BB10 handsets will no longer be able to integrate Facebook contacts with their BlackBerry contacts, and won't be able to share photos and other content directly to Facebook. BlackBerry expressed disappointment with Facebook's decision. Last month, WhatsApp also announced plans to stop supporting BlackBerry. WhatsApp plans to cease supporting a handful of older mobile operating systems by the end of the year. WhatsApp will stop working on devices running Android 2.1 and 2.2; all BlackBerry OSes, including BlackBerry 10; Nokia's S40 and Symbian S60 platforms; and Windows Phone 7.1. "While these mobile devices have been an important part of our story, they don't offer the kind of capabilities we need to expand our app's features in the future," explained WhatsApp in a blog post. WhatsApp suggests people relying on devices that run this operating systems upgrade to newer hardware if they wish to continue using WhatsApp. Facebook bought WhatsApp in 2014 for $16 billion. Facebook says WhatsApp has more than 1 billion users worldwide. BlackBerry today said it has agreed to acquire a company called WatchDox. WatchDox helps companies securely manage file syncing and sharing services across their business. BlackBerry says the acquisition will help it provide best-in-class security, and give its enterprise customers a higher degree of control over their data. BlackBerry also announced BBM Connect Games for the Android platform. With the latest version of BBM installed, Android device owners will be able to play games with their BBM contacts through the messaging service. According to BlackBerry, BBM Connect Games lets users interact, post achievements, and share game currency with others. The company launched three games alongside the updated BBM app to get Android users into the action. The games are free to download and are available in the BBM Shop. BlackBerry today said its BlackBerry Advertising Service will reach its end of life on June 16, 2015, after which the servers will be disabled and the APIs will no longer work. BlackBerry launched the service to help developers generate ad-based revenue via mobile applications. The company said, based on its continued efforts to realign its focus on enterprise customers, the BlackBerry Advertising Service is no longer a core offering. BlackBerry suggests developers remove their API calls from the service and explore other advertising options. BlackBerry today said BlackBerry OS 10.3.1 is available for device owners to download. The latest version of BlackBerry's operating system includes the Amazon Appstore for Android apps and brings back keyboard shortcuts to devices with physical keyboards. The OS also improves BlackBerry Blend (desktop messaging client), BlackBerry Assistant (voice commands), BlackBerry Hub (adds instant actions), and the Calendar app (adds Meeting Mode). The update also improves battery life and camera performance. BlackBerry 10.3.1 is available to the BlackBerry Q5, Q10, Z3, Z10, Z30, BlackBerry Porsche Design P'9983, and the Passport. BlackBerry's Classic smartphone harkens back to the devices of yesteryear. Its defining feature is a physical QWERTY keyboard, something phone makers have left in the past for good reason. Here are our first impressions of the Classic. BlackBerry has pushed out a minor update to BBM for its own smartphones. The update streamlines the process for attaching photos, files, or other content to BBM chats. The app also provides more notifications, and users can rate BBM Voice calls. The update is free. BlackBerry today said it signed an agreement with Amazon in order to offer more apps to owners of its BlackBerry 10 smartphones. The deal will add Amazon's Appstore to BlackBerry handsets running BBOS 10.3. BlackBerry claims the agreement will give BlackBerry owners access to an additional 200,000 applications. Further, BlackBerry said it will close the music and video content stores of BlackBerry World. BlackBerry owners will still be able to access and use any content they've already purchased from these stores, but the BlackBerry World music and video stores will no longer be available beginning July 21. The BlackBerry World store, as well as the Amazon Appstore, will continue to offer third-party music/video apps and services. BlackBerry is expected to released BBOS 10.3 in September. BlackBerry today made an SDK available to developers for its unreleased BlackBerry 10.3 operating system. The SDK provides developers with the tools they need to create apps that will function properly in the forthcoming OS update. BlackBerry didn't share too many details about the new SDK, but said it offers styling guidelines and user interface changes for apps. BlackBerry also teased some new hardware. It explained to developers that the SDK provides support for its traditional BBOS screens of 720 x 720 pixels (square) and 1280 x 720 pixels (16:9). The company added a new screen size and resolution that will measure 4.5 inches across the diagonal and include 1440 x 1440 pixels. This device will have a large, high-resolution square screen and a keyboard, much like the Q30 does. BlackBerry said more details about the phone will be made public later this year. In the meantime, developers can download the SDK for BlackBerry OS 10.3 and get to work on apps. BlackBerry today announced that it has agreed to allow several other, large mobile device management companies to support its BlackBerry smartphones. Until today, BlackBerry has only allowed its devices to be managed by its own Blackberry Enterprise Services product. BES 10 is a server-based tool licensed by large companies. According to BlackBerry, several companies, including AirWatch, Citrix, and IBM, have expressed interest in managing BlackBerry devices in addition to those running Android, iOS, and Windows Phone. Large corporations usually make use of such tools to run fleets of business-owned mobile devices. The change in strategy from BlackBerry marks a shift in its business model and its response to customer feedback. Companies may still use BES to manage Android and iOS devices. AT&T today said owners of the BlackBerry Q10 and Z10 smartphones can download and install BlackBerry OS 10.2.1. This update adds a wide range of new features to the Q10 and Z10 handsets. Some include: a customizable pinch gesture for filtering BlackBerry Hub content; the ability to access BBM from within any app; improved sound for BBM voice/video chats; more lock screen notifications; picture password; and improved battery life monitoring. AT&T says the free update can be installed manually via Wi-Fi. BlackBerry today indicated that it plans to focus on catering to C-level executives who want high-end smartphones with full, physical keyboards. The company has three such devices in prototype stages being tested and will introduce them over the next 18 months. Speaking to Reuters, BlackBerry John Chen said the company wants to win back the executives who were once its core customers. Chen also indicated that BlackBerry is weighing whether or not to create of version of Blackberry Messenger - known as BBM - for desktop computers. The idea is to allow business and government customers to carry secure conversations from their PCs to their smartphones and vice versa. BlackBerry has already made BBM available to Android and iOS devices, and is working on a version for Windows Phone, as well. BlackBerry today released an update to the official Facebook application for devices running BlackBerry 10. The improved app adds four main features. To start, users can now sort their newsfeed by Most Recent or Top Stories. 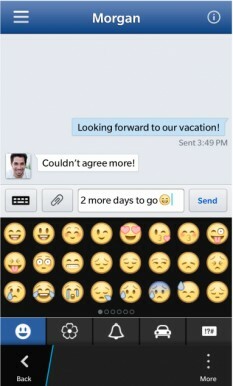 The app adds broad support for emoji and emoticons, which can be used in conversations. Facebook for BlackBerry adds photo tag support for the photo carousel, and adds a map view to check-ins, which lets people see a map of the location they're checking into. Facebook 10.4 for BlackBerry 10 is free to download from the BlackBerry World store. Verizon Wireless recently indicated that the BlackBerry 10.2.1 operating system is now available to the Z30, Z10, and Q10 smartphones. The update adds a wide number of new features, and makes significant changes to the behavior of several key apps. For example, users can create filters in BlackBerry Hub and customize their own pinch gesture to automatically view the filtered messages. The phone application makes it easier to answer or reject calls with a new swiping motion. Users can now create SMS and email groups for simpler bulk message addressing. The lock screen adds actionable notifications, such as the ability to open incoming messages. The update adds an FM radio to the BlackBerry Z30, Q10, and Q5, lets users set automatic software updates over Wi-Fi, and adds more business-centric features that rely on BES 10. The system update is free to download over-the-air or via Wi-Fi. BlackBerry today made Facebook 10.3 available to smartphones running BlackBerry OS 10 and up. The updated social networking app includes a wide number of new features. For example, Facebook for BlackBerry now supports inline tagging when composing status updates. The app also adds notifications for news stories when they are posted to the user's newsfeed, makes it possible to delete or hide posts from the timeline, as well as lets users cache content for offline viewing. Facebook 10.3 is free to download from BlackBerry World. BlackBerry today announced version 10.2.1 of its operating system for BlackBerry smartphones. The update adds a wide number of new features, and makes significant changes to the behavior of several key apps. For example, users can create filters in BlackBerry Hub and customize their own pinch gesture to automatically view the filtered messages. The phone application makes it easier to answer or reject calls with a new swiping motion. Users can now create SMS and email groups for simpler bulk message addressing. The lock screen adds actionable notifications, such as the ability to open incoming messages. The updated operating system adds a picture password, which uses a combination of a picture and a PIN to unlock the device. BlackBerry 10.2.1 lets users customize what appears on the settings menu, save web pages for offline reading, set preferred contact syncing, and improves the device/battery monitor to keep track of the handset and its status. The update adds an FM radio to the BlackBerry Z30, Q10, and Q5, lets users set automatic software updates over Wi-Fi, and adds more business-centric features that rely on BES 10. According to BlackBerry, BBOS 10.2.1 is available beginning today in the U.S., Canada, the Middle East, Africa, Latin America, and the Asia Pacific region. Exact timing will depend on carrier approval of the operating system. BlackBerry OS 10.2.1 is compatible with all BlackBerry 10 devices. BlackBerry was forced to remove Twitter for BlackBerry version 10.2.2 from its app store after discovering a large number of bugs in the app. The company received numerous complaints from customers about the application and is investigating the problems. In the meantime, BlackBerry suggests that users downgrade to Twitter version 10.2.1 until the newer version is made available once more. BlackBerry today announced a significant update to the Twitter client for devices running BlackBerry OS 10 and up. Twitter 10.2.2 adds a handful of features, including the ability to see photo previews when images are embedded within posts; the ability to set BBM status from within Twitter; the ability to reply to Tweets with a new composition tool; and improved search results. Twitter for BlackBerry 10 is free to download from BlackBerry World. BlackBerry today said that BBM Channels has graduated from beta status and will begin rolling out this afternoon to all BlackBerries running OS 5 and up. BBM Channels acts similar to social networks in that users can subscribe to channels, which are based on certain topics or brands, and receive updates when the channels have new content. Users can create their own channels and push updates to select groups of followers or users in a manner similar to Twitter. BlackBerry imagines that it will be best-used by companies and brands looking to connect with fans. BBM Channels will be available for download from the BlackBerry World store starting at 3pm Eastern Time. Verizon Wireless today announced that the BlackBerry Z30 smartphone will reach company stores in early November. The device will be sold for $199.99 with a new contract, or for $22.91 for 24 months for customers who choose Verizon's Edge upgrade plan. The Z30 has a 5-inch HD display and runs BlackBerry 10.2. BlackBerry today announced the release of BlackBerry OS 10.2. The updated operating system introduces a wide range of new features, such as Priority Hub, which learns what conversations are important to the user and automatically puts those messages at the top of the inbox. The inbox is now better at handling attachments, which can be organized across conversations. Other new features include improved BBM Video messaging with "natural sound"; previews of BBM, SMS, and email messages from within any app; improvements to the keyboard and copy-and-paste behavior; better sharing tools across social networks; reply to incoming calls with email, SMS, or BBM; and general improvements to the calendar. According to BlackBerry, BlackBerry 10.2 will be available in Africa, Asia Pacific, Canada, Europe, and the Middle East beginning this week. It will reach Latin America next month, but won't reach the U.S. until "this winter." As always, the timing of the operating system update's availability will depend on each individual country and carrier. 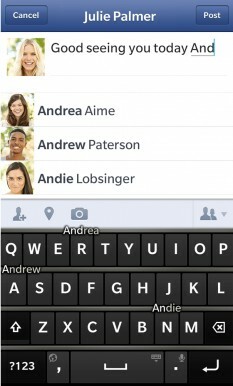 BlackBerry today announced a minor update to Facebook for its BlackBerry 10 devices. There are a handful of new features in the application, including the ability to delete status updates and other posts from within the app itself. Facebook for BlackBerry also now lets users preview links before posting them; use the app and view videos in landscape mode; see when chat messages have been read; as well as share wall posts on a friend's wall, in a group, in a list, or in a message. Facebook 10.2.2 for BlackBerry 10 is free to download from the BlackBerry World app store. Kik recently indicated that it has settled all litigation with BlackBerry. Kik developed a BlackBerry Messenger-like messaging product that works between a number of different platforms, including BlackBerry, Android, and iOS. BlackBerry sued Kik in 2010 and kicked the app out of the BlackBerry World app store for what it called "false and/or misleading statements" that lead to consumer confusion. According to The Globe and Mail. Kik's founder attempted to convince BlackBerry's management to make BBM a cross-platform service, but they refused. That's what spurred the development of the Kik app. Kik currently has about 90 million users, while BlackBerry's BBM service has shrunk to about 60 million users. BlackBerry attempted to release versions of BBM for the Android and iOS platforms just last month, but had to delay the rollout due to problems. BlackBerry today announced that a new version of Twitter is available to devices running BlackBerry OS10, such as the Z10 and Q10. The updated application adds a number of new features, including the ability to view, create, subscribe, and edit Twitter lists; see trends based on personal interests and location; and scroll through tweeted images in the photo image gallery. The new app also showcases related account profiles, makes it easier to see which tweets have video links, and syncs read DMs across all devices and Twitter accounts. Twitter 10.2.1 is free to download from the BlackBerry World app store. BlackBerry today announced massive job cuts amidst a large loss for its second fiscal quarter. The company expects to write down $1 billion in unsold Z10 smartphone inventory and post a loss of between $950 and $995 million. The company said it sold 3.7 million devices during its second fiscal quarter, but the bulk of them were its older BlackBerry 7 devices, and not its new BlackBerry 10 smartphones. As a result, it will layoff 40% of its global work force, or about 4,500 employees. After the cuts, BlackBerry will be left with 7,000 employees, about half what it was two years ago. Further, BlackBerry said it plans to make changes to its business. The company said it will "refocus on the enterprise and prosumer market." It will consolidate its hardware portfolio from six devices to four, including two high-end devices and two entry-level devices. BlackBerry announced earlier this month that it is exploring its strategic options, including a sale of the company, whether in parts or as a whole. BlackBerry is preparing to make deep cuts to its staffing, according to a report in the Wall Street Journal. The company is looking to reduce its headcount by as much as 40% by the end of the year as it tries to get a handle on costs amid poor sales of its devices. A BlackBerry spokesperson said, "Organizational moves will continue to occur to ensure we have the right people in the right roles to drive new opportunities in mobile computing," but declined to comment on the severity of the job cuts. BlackBerry is exploring strategic alternatives and may sell all or pieces of the company to investors. The sales process is expected to take place within a few weeks and has already drawn some interest from private equity firms. Just today, BlackBerry announced the Z30 smartphone and the availability of its BBM messaging service for Android and iOS devices. BlackBerry today announced the Z30, a new smartphone running BlackBerry OS 10.2 that has a 5.0-inch Super AMOLED 720p HD display and a dual-core 1.7GHz Qualcomm Snapdragon S4 Pro processor with quad-core Adreno graphics. The Z30 features stereo speakers and BlackBerry Natural Sound, which the company says improves the quality of BBM Voice and BBM Video chats. BlackBerry is using what it calls the BlackBerry Paratek Antenna, a new antenna design that improves voice and data performance in low-coverage areas. The Z30 also boasts 25 hours of active use thanks to the large, 2,880mAh battery. Other hardware features include an 8-megapixel main camera and 2-megapixel user-facing camera; LTE, Bluetooth 4.0, NFC, dual-band Wi-Fi, and GPS; and 16GB of on-board storage with support for microSD cards up to 64GB. The BlackBerry 10.2 operating system makes some changes to BlackBerry Hub, which now learns which conversations and social media messages are most important to the owner and prioritizes them. BlackBerry Messenger now provides previews of incoming messages as they arrive, even when using other apps. The previews can be dismissed or opened. 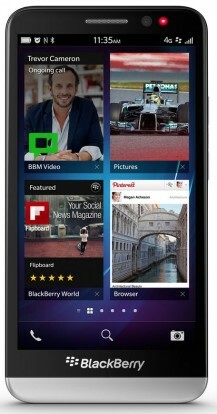 The BlackBerry Z30 will first go on sale in the U.K. and Middle East later this month. It is expected to reach other regions before the holidays. BlackBerry said that BlackBerry OS 10.2 will be made available to the Z10, Q10, and Q5 smartphones in October. 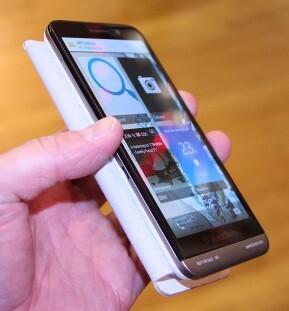 C Spire Wireless today announced plans to sell the BlackBerry Q10 in the near future. Exact pricing and availability details will be shared soon. Private investors are eyeing BlackBerry and its assets, but not the entire company, reports Reuters. Several equity firms have signed non-disclosure agreements with BlackBerry in recent weeks to explore acquisition possibilities, though Reuters' sources say it is likely the company will be broken up and sold in pieces. Private equity firms are looking at BlackBerry's operating system and the patents surrounding its keyboards, in particular. One of BlackBerry's largest investors, Fairfax Financial Holdings, has met with other financial firms in hopes of finding a way to take the entire company private, but it holds only about 10% of the firm. Reuters says the sales process is expected to begin within a few weeks. BlackBerry announced last month its intent to "explore strategic options" after its BlackBerry 10 operating system and handset failed to generate interest among consumers. BlackBerry today announced that it has formed a committee to evaluate the firm's strategic alternatives moving forward. According to BlackBerry, the list of alternatives the company plans to consider include possible joint ventures, strategic partnerships or alliances, a sale to a third party, or other possible transactions. The special committee members include Barbara Stymiest, Thorsten Heins (BlackBerry's CEO), Richard Lynch, and Bert Nordberg, and will be chaired by Timothy Dattels. BlackBerry did not place a deadline on when it might make a decision about its future. BlackBerry launched the BlackBerry 10 platform earlier this year, and sales of its new smartphones have not caught on as the company hoped. AT&T today announced that the BlackBerry Q10 will be available beginning June 21 for $199.99 with a new contract. AT&T is also offering a minimum trade-in reimbursement of $100 to customers who swap their old phone for the Q10. Skype today announced that its video messaging service has graduated from beta status and is widely available for use. The service, which has been in trials since February, allows Skype users to record and send video messages (up to three minutes long) to other Skype users. Skype said that video messages can be viewed on any platform, but in order to record and send messages users must have devices running Android, BlackBerry, or iOS. Microsoft's own Windows Phone platform is not yet able to record and send Skype video messages. The feature is free to use, and Skype said that users can send an unlimited number of messages. BlackBerry today announced the availability of Facebook 10.2.0 for devices running BlackBerry 10. The revised version of Facebook brings with it the updated Newsfeed, which has new icons and easier navigation. The app also has expanded photo features. BlackBerry 10 owners can create new photo albums from their photo page, where they can upload photos or complete albums, add tags to photos, and easily switch between photo albums. The app also includes minor bug fixes and performance enhancements. Facebook 10.2.0 for BlackBerry 10 is free to download from BlackBerry World. BlackBerry today announced that it will make versions of its BlackBerry Messenger application for both the Android and iOS platforms. The application and service will be available to the iPhone and Android devices later this summer. Basic messaging and groups support will arrive first, and other features, including BlackBerry Voice, BlackBerry Video, and screen sharing. Additionally, BlackBerry expects that iOS and Android users will also be able to use the just-announced BBM Channels later this year. BlackBerry Messenger has to-date been a BlackBerry exclusive app and service. 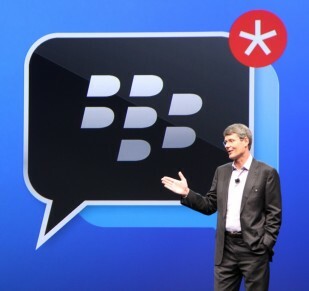 BlackBerry today announced a new piece of its BlackBerry Messenger platform called BBM Channels. It acts similar to social networks in that users can subscribe to channels, which are based on certain topics or brands, and receive updates when the channels have new content. Users can create their own channels and push updates to select groups of followers or users in a manner similar to Twitter. BlackBerry imagines that it will be best-used by companies and brands looking to connect with fans. AOL today announced that it has struck a partnership with Verizon Wireless to distribute its content on Verizon's smartphones and tablets. The content will show up in the Verizon Wireless Home web portal and will be bookmarked within the browser on Verizon devices. The AOL portal will feature up-the-minute news headlines, weather, and maps, as well as provide access to video content. The portal will appear on smartphones and tablets running Android, BlackBerry, and Windows Phone, but not iOS. Customers will be able to customize the type of content that reaches their devices. The AOL content is expected to become available later this summer.